Dean Jim Ermatinger is described by colleagues as a creative leader and a supportive mentor, and it's for these reasons and more he has been selected UIS Employee of the Month for September 2013. In addition to being a well-liked colleague, Jim takes on more work in an effort to help the university. He "has served as Dean of not only the largest college in our institution, but for the last two years, he has served as Dean of two colleges, and has done so with excellence and grace, which demonstrates his admirable work ethic and commitment to the institution," writes his nominator. "He does all of this with a smile and a great sense of humor." In spite of the extra time he may have to spend at the office because of these additional responsibilities, "he still makes time to go to the gym, setting an excellent example of time management skills and communicating the importance of making time for healthy activities," his nominator noted. 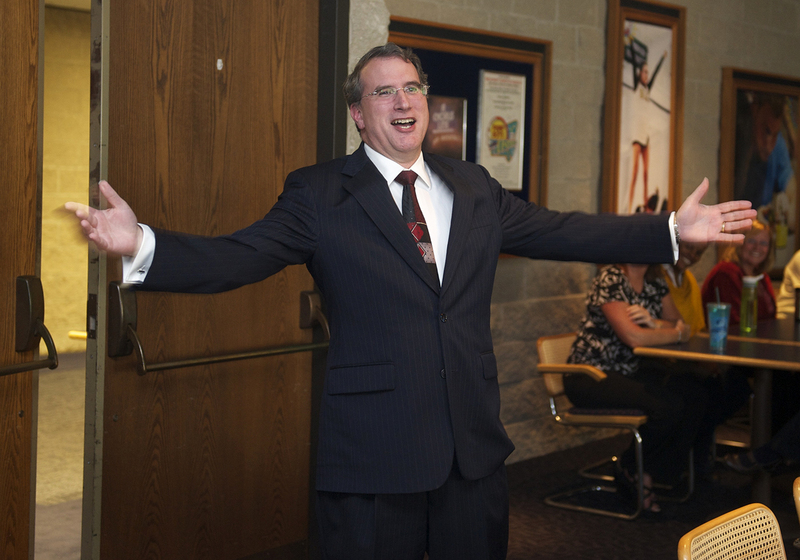 "Dean Ermatinger genuinely cares about the success of the faculty, staff, and students with whom he works, and his efforts contribute significantly to the success of UIS as a whole." Upon learning he'd been selected as UIS Employee of the Month for August 2013, Keith McMath said what his nominator probably expected him to say: "You just do what needs to be done for those that we serve." Keith, who works as the Assistant Director of Housing, was commended by his nominator for always putting students first and treating them respectfully. "He will patiently and professionally address student concerns, taking time to meet with them individually," his nominator writes. "Keith is the epitome of working well and relating well to residents, their parents, our campus staff and colleagues, vendors and contractors, and other internal and external stakeholders." When someone is needed to resolve a problem, Keith is the person to turn to. "When I ask him to look at something or take on a new challenge, his standard reply is 'I'm on it,'" writes his nominator. "And I can absolutely trust that he is because, invariably, it gets done sooner than expected. He is the consummate team player." "He brings his A-game on a daily basis to the Residence Life Team!"